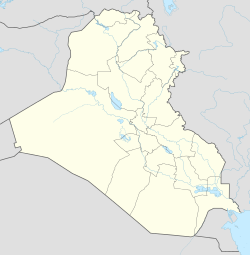 Al-Shamiya (Arabic: الشامية‎) is a city in Al-Shamiya District, Al-Qādisiyyah Governorate, Iraq. It is roughly 147 km south of Baghdad on the Al-Shamiya branch of the Euphrates. Settlement dates back to Sumerian times, but the modern city was established in 1822 during the Ottoman era, named "Hamidya" after Abdul Hamid II. 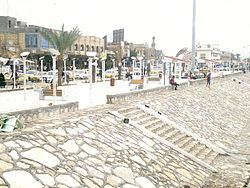 It was renamed Al-Shamiya (meaning Levantine) after the establishment of the Kingdom of Iraq. The city's population has grown quickly, from 189,000 in 1997 to 230,974 in 2007 to an estimated 300,000 in 2014. The population has been homogeneously Shia for centuries, and many descend from the Arab tribe of Nukha. It is located in the fertile, irrigated, drained, and alluvial plain of the middle Euphrates region. The area surrounding the city is notable for its crops, especially rice, dates, and wheat. Wikimedia Commons has media related to Al-Shamiya. مديرية زراعة الديوانية / شعبة زراعة الشامية،بيانات غير منشورة. وزارة الموارد المائية / دائرة ري الشامية، بيانات غير منشورة. This page was last edited on 23 July 2017, at 16:02 (UTC).